This tres leches cake is light, fluffy and indulgent all at the same time. “Three milk” cake with no dairy or grains? It’s simple & SO delicious. I’ve been back from tour for a week and it feels so good to be back in the kitchen again. Being on the road is exciting, and extremely interesting, but for a foodie, it’s challenging. I’m one of those people who love to cook and create new recipes, eat meals that I know are full of healthy and fresh ingredients and who spends most of their time either in the kitchen or at the Farmer’s Market. The night we returned we made a big taco dinner with grass-fed beef, homemade guacamole, cilantro lime cauliflower rice and Siete’s almond flour tortillas (if you haven’t tried them you MUST- so good). We were stuffed, but as we do in our family, made room for a dessert. This tres leches cake was the perfect compliment to our Mexican themed dinner. It’s light, fluffy and indulgent all at the same time. I know it may sound near impossible to make a great “three milks” cake with no dairy but it’s possible!! In fact, it’s relatively simple and is so delicious. 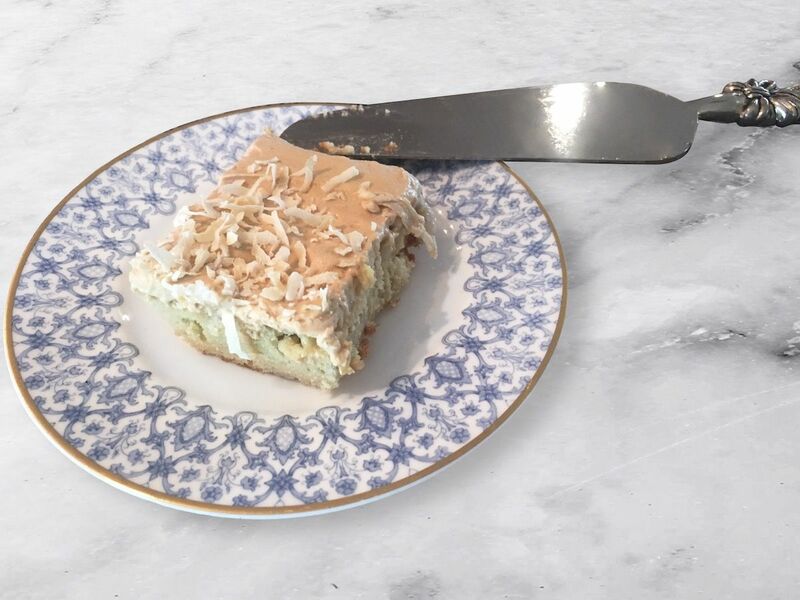 Try this paleo friendly tres leches and let me know how you get on in the comments! Preheat oven to 350F and lightly grease a glass 8x8 dish with coconut oil. Add the wet ingredients in the bowl and mix until smooth. While the cake is cooking, make your cream drizzle by bringing the coconut milk to a boil. Add maple syrup and reduce to a simmer for 30 minutes. Be careful not to burn and stir occasionally. Remove the cake from the oven and let slightly cool. Poke holes in the top of the cake and pour your drizzle all over the top, so the liquid falls through the holes. Refrigerate the cake for at least 30 minutes. To make your frosting, place the coconut cream, maple syrup and vanilla extract in a large bowl and whip with a hand mixer. Place in the fridge until you are ready to eat, then frost and serve!